The federal government will kick in CDN$1.28 billion into the project that will is budgeted for approximately CDN$6 billion. The rest of the funding will be led by Caisse de dépôt et placement du Québec (CDPG Infra) and the Quebec government as part of a public / public partnership. 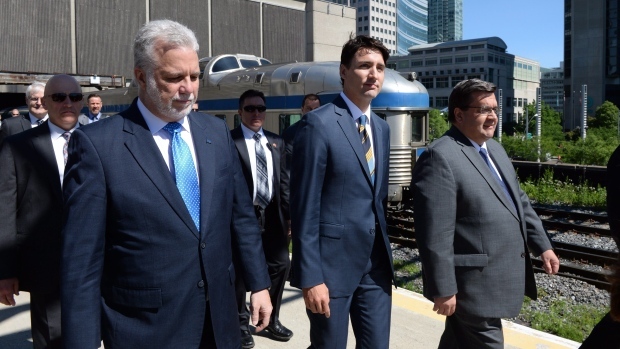 “In addition to making it quicker and easier for millions of Quebec residents to get around, the REM will reduce the number of cars on the roads, help ease traffic and make the air cleaner,” Trudeau said. Quebec Premier Philippe Couillard, Montreal Mayor Denis Coderre and the head of the Caisse, Michael Sabia, were also on the hand for the announcement. 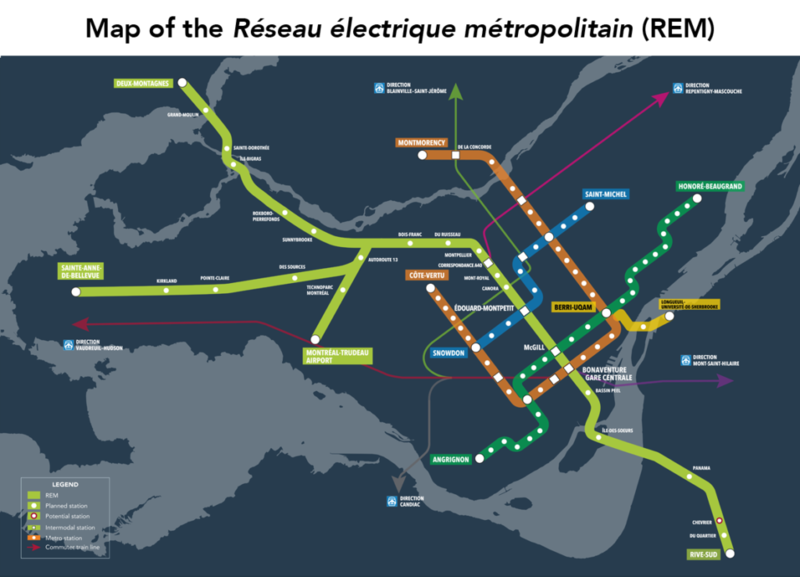 REM is a 67 kilometres (42 miles) long automated light rail transit line that will link downtown Montreal with the South Shore and the West Island with its own right of way and without any road crossings. The line has a very ambitious timeline and scheduled to be completed by early 2020s with 27 stations. At completion, it would the world’s fourth longest automated LRT behind Singapore (82km / 51 mi), Dubai (80 km / 50 mi) and Vancouver (68 km / 42 mi). The entire line will be doubled tracked and will be split in a mix of underground, aerial and ground routing. The latter will form the major portion of the network which contributed to lower overall construction costs. 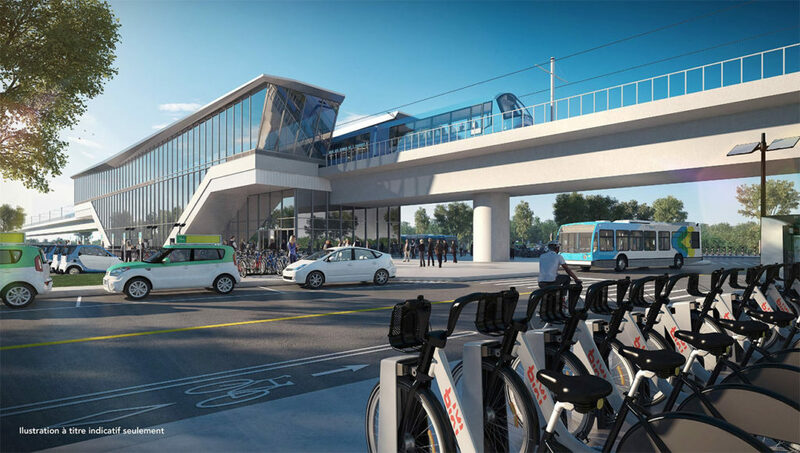 The REM line has been designed with multimodal connections in mind and will have integrated points with subways, bus network, bike and car sharing facilities. Cutting through downtown Montreal vertically with branches going south/southeast and west/northwest will lead to significantly less travel time for residents and visitors alike. 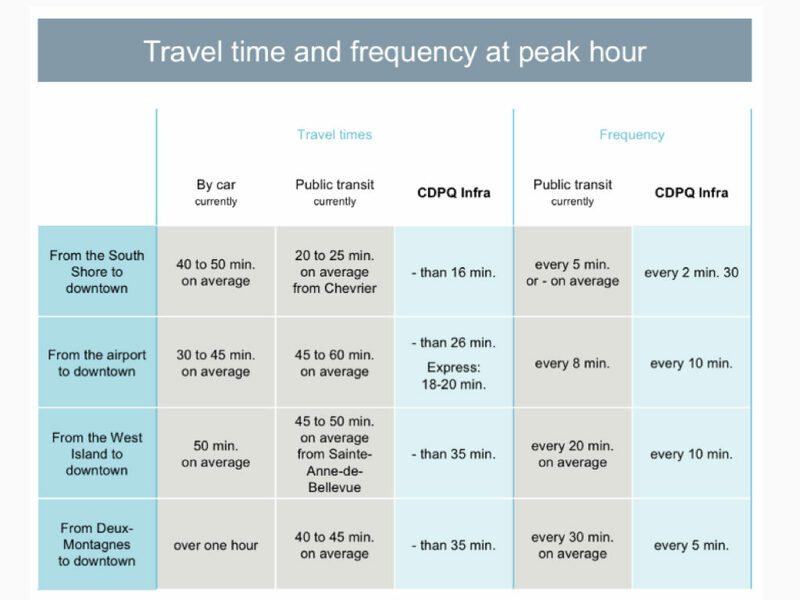 It is estimated that travel time from the Pierre Trudeau International Airport to downtown could be reduced from between 43 to 70% over current public transit options and between 13 to 60% over car. The airport portion will be underground and be directly connected to the terminal. WiFi equipped trains will have a capacity of 150 per car and can be switch between 2 to 4 car service (up to 600 passengers per train). They will run from 5:00 am to 1:00 am daily to connect the first departure and last arrival bank of flights. Running on electricity will make the system more environment friendly and passengers will create less carbon footprint than using car or existing public transit. The total construction costs are tentatively budgeted for CDN$6.04 billion which translates to between CDN$0.69 to 0.72 million per kilometer. Construction is scheduled to begin in Fall 2017 and will create 34,000 direct and indirect jobs. 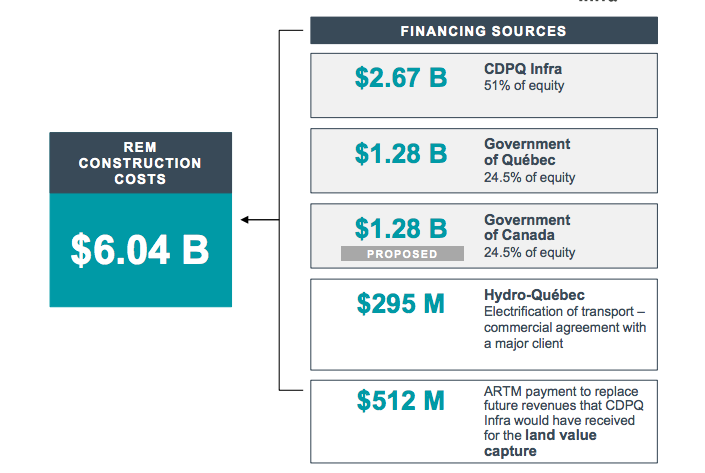 Within the first four years of operations, CDPQ Infra estimated that the network will contribute roughly CDN$3.7 billion to Quebec’s Gross Domestic Product (GDP) while creating 1,000 permanent jobs. Airline ticketing and check in areas at key stations. Flight departure and arrival boards at key stations. Train designs should include baggage storage space. Fare integration with other modes of transportation. In particular, it would be very useful for passengers to buy a REM ticket as part of the airline or regional train experience. Location integration (e.g. use of artificial intelligence to notify and schedule train time as part of one itinerary). Retail (e.g. Duty Free) and marketing zones (e.g. tours and attraction) for locals and visitors. Create new indoor/outdoor landside space (e.g. similar to the market at Amsterdam Airport Schiphol (AMS) or outdoor concert / event space at Denver International Airport (DEN)) to maximize airport use outside of travel and improve ancillary revenue. Incorporating the REM in the airport city strategy for growth around the area. 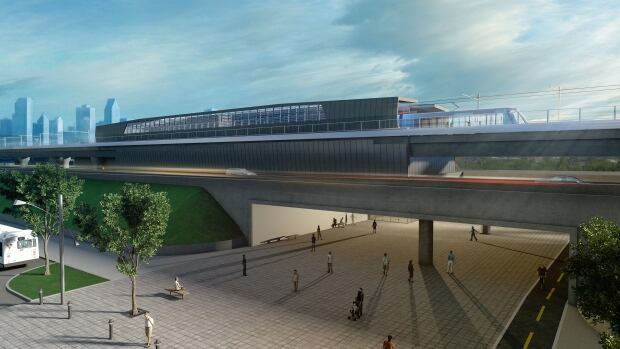 Improve connection between airport, surrounding area hotels and the VIA Rail Dorval Station to maximize use of REM as a connection point as part of the city and province’s multi-modal and transit oriented development strategy.